For simplicity, the code generates sample telemetry values for the Chiller. You could extend the sample by connecting real sensors to your device and sending real telemetry. Sends metadata to the solution to describe its capabilities. Responds to actions triggered from the Devices page in the solution. Responds to configuration changes send from the Devices page in the solution. To complete this tutorial, you need an active Azure account. If you don't have an account, you can create a free trial account in just a couple of minutes. For details, see Azure Free Trial. Before you write any code for your device, deploy your Remote Monitoring solution accelerator and add a new real device to the solution. When the deployment process for the Remote Monitoring solution finishes, click Launch to open the solution dashboard in your browser. If you have already added a device in your solution, you can skip this step. However, the next step requires your device connection string. You can retrieve a device's connection string from the Azure portal or using the az iot CLI tool. For a device to connect to the solution accelerator, it must identify itself to IoT Hub using valid credentials. 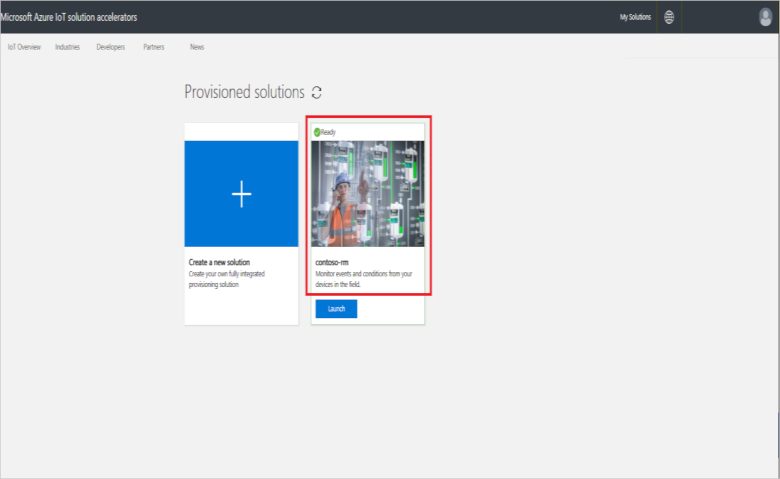 You have the opportunity to save the device connection string that contains these credentials when you add the device to the solution. You include the device connection string in your client application later in this tutorial. You've now added a real device to the Remote Monitoring solution accelerator and noted its device connection string. In the following sections, you implement the client application that uses the device connection string to connect to your solution. The properties the device reports to the solution. For example, a Chiller device reports information about its firmware and location. The types of telemetry the device sends to the solution. For example, a Chiller device sends temperature, humidity, and pressure values. The methods you can schedule from the solution to run on the device. For example, a Chiller device must implement Reboot, FirmwareUpdate, EmergencyValveRelease, and IncreasePressure methods. 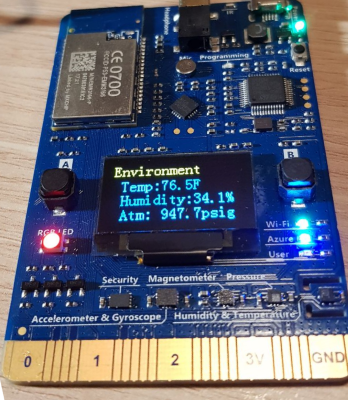 This how-to guide shows you how to run a sample application on your IoT DevKit device. The sample code sends telemetry from the sensors on the DevKit device to your solution accelerator. The MXChip IoT DevKit is an all-in-one Arduino compatible board with rich peripherals and sensors. 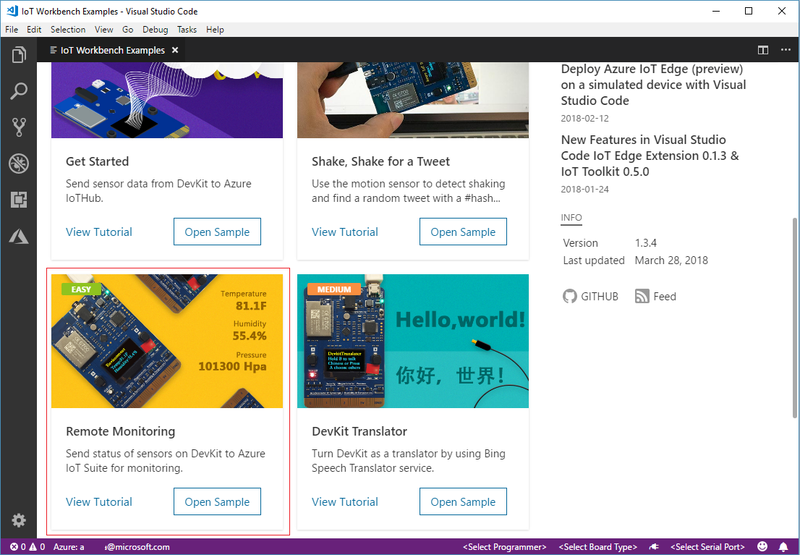 You can develop for it using Azure IoT Device Workbench or Azure IoT Tools extension pack in Visual Studio Code. The projects catalog contains sample applications to help you prototype IoT solutions. 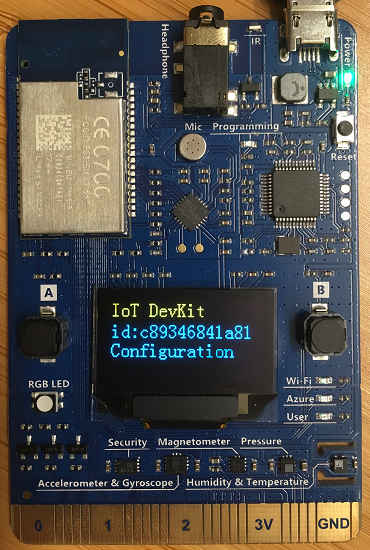 Prepare your DevKit by following the steps in Connect IoT DevKit AZ3166 to Azure IoT Hub in the cloud. Make sure your IoT DevKit isn't to your computer. Start VS Code first, and then connect the DevKit to your computer. Click F1 to open the command palette, type and select Azure IoT Device Workbench: Open Examples.... Then select IoT DevKit as board. Push and release the Reset button. The screen displays the DevKit ID and Configuration. 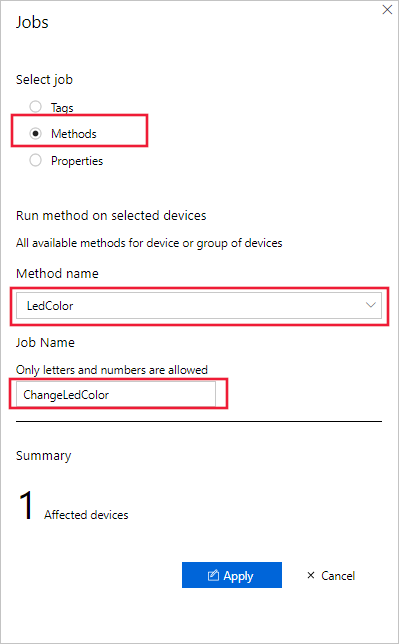 Press F1 to open the command palette, type and select Azure IoT Device Workbench: Configure Device Settings... > Config Device Connection String. Paste the connection string you copied previously and press Enter to configure the device. The DevKit device reboots and runs the code you uploaded. 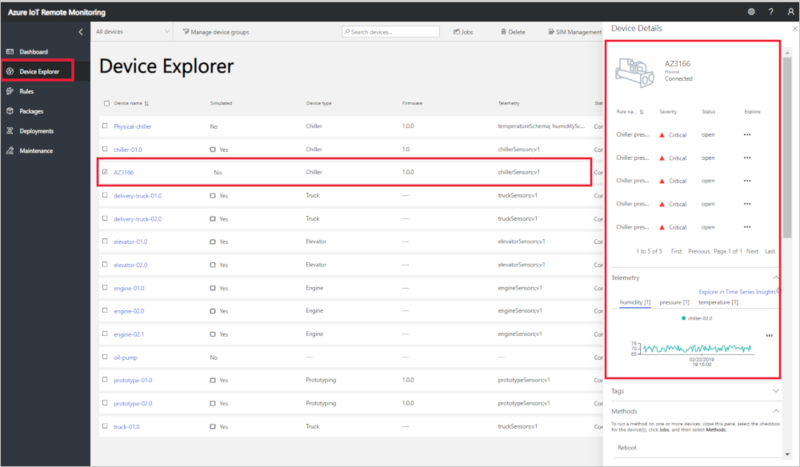 Go to your solution dashboard, and click Device Explorer. If you plan to move on to the tutorials, leave the Remote Monitoring solution accelerator deployed.